SmartAsset, a startup incubated by Y Combinator, aims to help consumers make the major financial decisions in their lives. Right now, the site is focused on homebuying — founder and CEO Michael Carvin tells me the service originated in his own experience purchasing a home. When he was trying to figure out whether buying made sense, he found that online resources were pretty lacking, with lots of advice in the form of blog posts (“Content can be helpful, but me reading about your aunt buying a home or your cousin buying a home doesn’t really help me,” Carvin says) plus financial calculators with little depth and dubious accuracy. So instead, Carvin built his own financial model to figure out how the purchase would affect his finances over time, and he realized that as long as he stayed int he home for at least a few years, buying was good move. With SmartAsset, Carvin has tried to create a service that essentially allows consumers to make the same analysis he did. You enter your basic financial information, like income, savings, and debt. 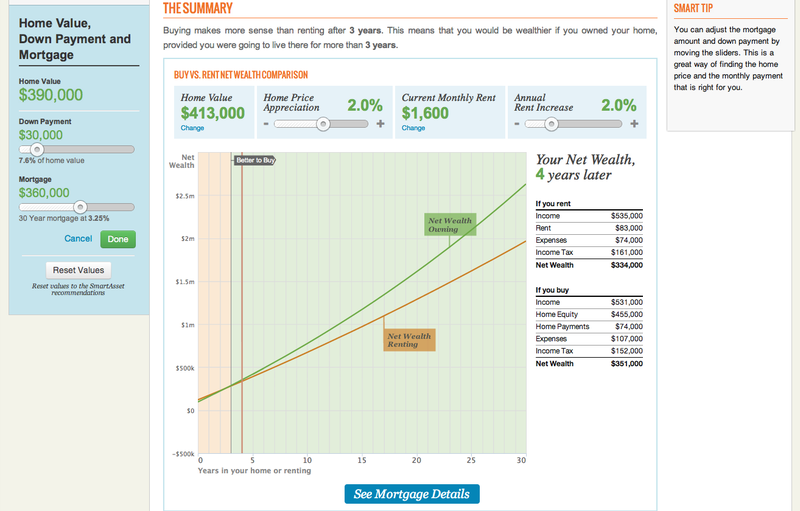 Then SmartAsset tells the maximum price of the home that you can really afford and offers a graph modeling the rent vs. buy decision, depending on how long you plan to live in the home. It also shows the kinds of products and programs that you qualify for, and makes recommendations on things that might save you money. And it tells you about the tax implications of your decisions, which of course change depending on where you’re going to live. Ultimately, a prospective homebuyer should be able to get the data they need to make an informed decision. And Carvin says the financial models that SmartAsset has built on the backend can eventually be extended to other important decisions, like saving for retirement and buying or leasing a car. Eventually, whenever someone has to make a big financial decision, Carvin wants SmartAsset to be the first place they think of visiting. Homebuying is a good place to start connecting with consumers around that broader vision, he adds. SmartAsset will offer its tools for free, with a business model based on advertising and lead generation.